Studying a Master of Dietetics at Swinburne will empower you to make a positive impact on the health of Australians. You will develop skills in both traditional and emerging areas of dietetic practice, learning to work with a range of evolving food and health management strategies. Units cover a range of innovative topics including entrepreneurship, leadership and business, sports nutrition, and paediatric nutrition. The course includes face-to-face lectures and tutorials, seminars, theoretical and practical coursework, kitchen workshops, online learning, and professional placement. Think dietetics is just about your diet? Think again. 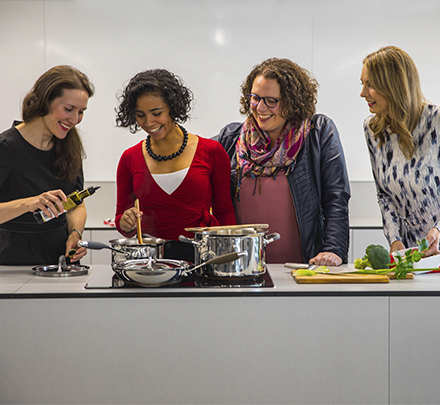 Three students from the tight-knit Master of Dietetics course share how Swinburne is getting them ready for the future of dietetics. Hint: it involves a non-diet approach, industry immersion, and rubbing shoulders with The Mindful Dietitian, and dietitians from Richmond and Hawthorn football clubs. The Masters of Dietetics will engage students in 105 days of placement. Placements consist of a 5-day research placement in first year followed by four 5-week block placements in subsequent years. Eligibility for professional accreditation requires the successful completion of 100 days. Graduates will be ready to take on roles in a range of areas, including clinical practice, community and public health, corporate and digital health, nutrigenomics, aged care, nutrition, food service management, sport and fitness, food sustainability and research. demonstrate cultural awareness of local and international environments in which they will be engaged and recognise the importance of communicating in a culturally appropriate way. The university has received Program Qualification from the Dietitians Association of Australia (DAA) and has sought advice regarding the processes for the accreditation of the dietetics program. The university is planning to submit an accreditation application within the required timelines, and aiming to achieve accreditation prior to graduation of the first cohort of students. A graduate of an accredited program is eligible to become a member of DAA with dietetics qualifications, and to join the Accredited Practising Dietitian (APD) Program. Full details of the stages in the DAA accreditation process are available here. All enquiries regarding the progress of the program’s accreditation review should be directed to the university’s Dietetics Program Coordinator. A graduate of a program accredited by the Dietitians Association of Australia (DAA) is eligible to become a DAA member with dietetics qualifications, and to join the Accredited Practising Dietitian (APD) Program. APDs are required to undertake prescribed levels of professional development each year and comply with the DAA Code of Professional Conduct and Statement of Ethical Practice. Eligibility for APD status, or current APD status is a prerequisite of many dietetic positions in Australia. APD status is required for a Medicare or Department of Veterans’ Affairs provider number and for provider status with many private health insurers. c.	Food and Nutrition Science, 2 units (equivalent to 25% of a year study load). Students who are otherwise eligible but are lacking a small number of pre-requisite units may be able to apply and receive a conditional offer subject to them successfully completing the required pre-requisites in Semester 1 (as non-award units), before commencing the degree in Semester 2.